This interactive course is in text format. 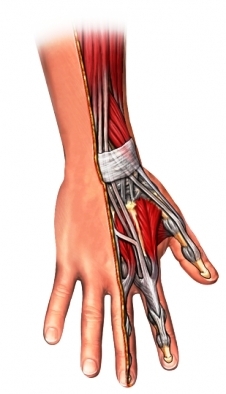 This online course is designed for the intermediate and advanced clinician in search of a comprehensive guide to managing extensor tendon injuries. " The Extensor Tendons: Anatomy and Management," authored by Erik A. Rosenthal and "Clinical Management of Extensor Tendon Injuries," authored by Rosyln Evans OTR, CHT is taken by permission, from Rehabilitation of the Hand, 5th edition. This lesson includes extensive information on anatomy, terminology, biomechanics, clinical considerations, treatment interventions, protocols, and the most up-to-date research on the management of tendon injuries. Learn therapeutic treatment regimes for pathology of Mallet finger to multiple lacerations of the proximal extensor tendons. Learn patterns of scars and how they can interfere with motion and function. Upon Successful completion of the examination (75%) your certificate will be sent via email. This item is no longer available through LiveConferences.com. We apologize for any inconvenience this may cause you. So happy to have this available as I am out of the country and needed CME's for credentialing. Fast, convenient, cost effective and educational material. Thanks for this opportunity in virtual learning! Awesome! Helped me pass the CHT exam!! After purchase is complete please register the course to the participants name and email address where the certificates will be received. Participants have one year to access the CEU course and exam to obtain CEUs. All CEU activities are associated with an online exam to ensure understanding of learner objectives. Once an 80% is achieved a CEU certificate is sent to the email that was used for registering the participant for the CEU course. Course cancellations or refunds are not available once the material or the exam have been accessed. Treatment2go is an AOTA approved provider ID #3397. The assignment of AOTA CEUs does not imply endorsement of specific course content, products, or clinical procedures by AOTA. NBCOT® is a registered trademark of the National Board for Certification in Occupational Therapy, Inc. and does not promote or endorse our specific courses, services or training.